Grace Ho may have worked for a series of blue-chip multinationals throughout her career, but she remains a Singaporean through and through - one can tell from her love of acronyms. SingPost's chief commercial officer has this pithy catchphrase to sum up her value system: ACE. Be Authentic to yourself, have the Courage to accept that you cannot be everything to everyone, and surround yourself with people and activities that give you positive Energy. 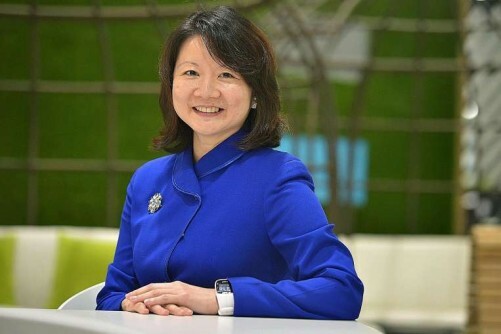 This is the attitude that has helped Ms Ho, 46, succeed throughout her impressive career, which includes stints at tech giants Microsoft, Hewlett-Packard (HP) and SAP, before joining SingPost last year. But it was not all glamorous, especially in the beginning. "When I graduated from the National University of Singapore in 1991, the economy was in a recession and as a fresh graduate I had loans to pay. My mindset was: I would take any job that was offered to me," she recalls. She had graduated with a degree in biochemistry and biology, but took up a sales job at Borland Software and found herself pounding the streets every day. "You really had to work very hard and walk the streets. One of my daily rituals was to go to the buildings along Shenton Way, look at the directories and walk floor by floor," she says. "If I came across a company that looked like a target customer, I would leave a brochure behind and ask the receptionist for a 'with compliments' slip with the name of the company's human resources or IT head. And the next day, I would follow up with calls." Far from finding it a grind, she enjoyed the experience and found it very satisfying to close deals. She did well and moved on to a role selling recruitment services and IT training programmes for human resources firm Drake International. Within a few years, she managed to save up enough funds to pursue a full-time MBA in Australia focusing on strategy, marketing and finance. Just before she completed her MBA, in 1996, she was called by HP, which put her through 11 rounds of interviews before hiring her for a role in its regional marketing centre in Singapore. It is a role she credits for the values that shaped who she is today. "HP taught me about having a strong sense of integrity and honesty. HP also has strong practices around multi-year business planning, which honed my skills in structure, strategic planning and thought leadership." She then joined Compaq in 1998, but had been there for only about a year when she was headhunted by Microsoft, which was starting up its Singapore operations at the time. Microsoft hired her to set up its Singapore tele-sales team - a bold move that many thought was a step down for Ms Ho at the time. To her, this was where the "C" in ACE came into play. "A lot of people asked me why I moved from a regional role at HP and Compaq to a Singapore-focused role at Microsoft. I feel sometimes you have to take some risks in life, while looking at your strengths. "If you see a road less travelled, but you're confident that you can do really well, take that plunge. With hard work and perseverance I'm sure you can make something of it - which was what I did." She stayed for 10 years at Microsoft, taking on bigger responsibilities along the way. She eventually moved to Microsoft's headquarters in Redmond, Washington, to head global product management for Windows Mobile. After two years she decided to return home to ride on Asia's growth wave, and was promptly recruited by Motorola Solutions to start up its healthcare enterprise solutions business here. She was soon headhunted yet again, this time by SAP, which wanted to transform its Asia-Pacific marketing team. And then last year, she started getting calls from SingPost. "They were also going through a transformation and they were looking for local leaders to help them drive their commercial transformation agenda." She moved over in April last year, nine months after SingPost approached her, as she felt she needed to finish her job at SAP first. Again, one might ask why she chose to join a local firm after having enjoyed a string of successes at the world's top tech companies. And again, the answer was that the challenge was just too exciting to resist. "The job was interesting - to take the marketing and sales teams and figure out the strategy and structure that we need to put in place to support the company's growth and make it the global leader in e-commerce logistics and trusted communications." Her resume may give the impression that Ms Ho has sailed through her career with hardly a hitch, but she is quick to acknowledge that she has faced prejudice at the workplace. "I've worked mainly for multinational tech companies. It's inevitable that as you rise higher in such firms, you'll find that you're one of very few females in boardroom discussions, and certainly one of very few Asian females. Unfortunately that leads to stereotyping." People often had preconceived ideas of who she was and what her decision-making style would be - and were blissfully unaware they were being sexist. "A man once commented to me after a meeting that he was pleasantly surprised that I could be decisive without being offensive," she recalls. Ms Ho, who will be sharing her experiences and thoughts on women and leadership at the Break the Ceiling, Touch the Sky summit next Monday, has this piece of advice for female leaders: "Don't succumb to the pressure of trying to be someone you're not because you think that will help you make better decisions." She also recommends developing a network of strong mentors - people who can be very candid about your blind spots without being judgemental. And women should also know when to blow their own trumpet, she adds. "Be confident about your strengths and amplify them at the right moment." But for anyone, male or female, who wants a recipe for success, Ms Ho has another truly Singaporean acronym - ECP: effort, courage and perseverance. Ms Ho, who is single, enjoys a strong bond with her family and network of friends. "I fail all the time but the key is to pick yourself up. When you have a strong group of friends and mentors, they give you the strength to press on."